The Drudge headline this morning is uncannily accurate. 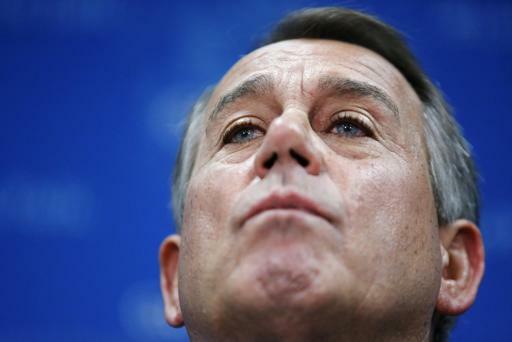 On it is a photo of John Boehner, looking down his nose at us…just like Obama. Why? Because he, with McConnell, are about to sell us out. Again! I first saw the news from an email alert by Erick Erickson of Red State. That was followed by others. Then I saw the Drudge headliner and I knew the fix was in. Boehner and McConnell have been embarrassed by the revolt in their ranks by the conservatives. Boehner received no-so-subtle threats to his Speakership. McConnell had a hissy-fit and behind closed doors, cussed Ted Cruz and Mike Lee. Neither Boehner nor McConnell care about the effects of higher debt, funding Obamacare, the continued degradation of our nation. Nor are they concerned by the growing dictatorial acts by Obama. Boehner and McConnell are firmly entrenched as members of The Ruling Class. Big government is their personal goal as much as it is for Reid, Obama and the dems. So what is their current plan? To give in and approve a debt-limit increase AND funding Obamacare. No spending cuts. No reining of government. No, just complete capitulation. I’m being told by several sources that Speaker Boehner and Majority Leader Eric Cantor are plotting to give up trying to either defund or delay Obamacare. This comes at the same time the Obama administration admits it will be months before their Obamacare website will be fixed and Kathleen Sebelius is saying if people want out of the mandate they can pay a fine. Nonetheless, Cantor, Boehner, and with them Mitch McConnell and John Cornyn are expected to cave in and fully fund, unimpeded, Obamacare. They will work up a new deal that includes a debt ceiling increase with a few sops to the GOP as cover. The only change they are still considering it the medical device tax repeal, which is being heavily lobbied for by former Boehner and McConnell staffers who left for K Street. A number of Democrats who are recipients of campaign cash along with these Republicans may provide a crony capitalist bridge over which this one tax repeal can pass while leaving in place all the other taxes, penalties, and fees. But John Boehner, Eric Cantor, Mitch McConnell, and John Cornyn will ensure that Obamacare is fully funded and give the American public no delay like businesses have. In doing so, they will sow the seeds of a real third party movement that will fully divide the Republican Party. I’m not so sure about that last paragraph, but Boehner and McConnell are undermining any confidence by the GOP core in the party establishment in Washington. If the rank and file of the GOP have no confidence in their party, what obligation do they have to continue to vote for the party? None. My wife and I didn’t watch the debates last night. It’s just as well. Twitter kept my phone and tablet beeping. We watched some video excerpts later. It was a pitiful performance by Obama—an example of an amateur meeting a professional. The dems were so outraged they attacked their own—Jim Lehrer of PBS, the moderator. DENVER, Colo. — Obama spokesperson Stephanie Cutter took a swipe at moderator Jim Lehrer’s largely passive debate performance tonight, saying the PBS anchor had allowed Mitt Romney to act as the moderator. “I sometimes wondered if we even needed a moderator because we had Mitt Romney,” Cutter told CNN shortly after the debate, though she told POLITICO that Lehrer did his job as moderator and that her comments were strictly about Romney. Pitiful! But, I’m not in the pitying mood. Univision had an expose’ over the weekend—on Fast and Furious. It was the first many in the Hispanic communities heard of it. They aren’t happy. On the heels of staging a successful presidential forum, Univision, the largest Spanish-language network in the U.S., has uncovered more information on the failed Operation Fast and Furious. Fast and Furious resulted in nearly 2,000 high-powered weapons travelling across the border to be used by Mexican drug cartels that has resulted in the deaths of dozens, if not hundreds, of innocent civilians. As we have been reporting, Administration officials have been less than revealing about what they knew about the ill-conceived Fast and Furious Operation, including the strong possibility that Attorney General Eric Holder may have contradicted himself in sworn congressional testimony. It was embarrassing to Obama so he took steps to correct the situation. He selected the wife of the owner of Univision to be an Ambassador. I guess if you can’t refute the facts, try bribery. President Barack Obama appointed Cheryl Saban, wife of the owner of Univision, as U.S. representative to the United Nations, according to reports from various news blogs. According to the Politico blog, Haim Saban, owner of the television network, backed Hillary Clinton in 2008, but during the summer donated $1 million to groups supporting the campaigns of Democrats. And according to another blog in Spanish of Yahoo, the appointment of Cheryl Saban to the diplomatic post was made last Wednesday, the day before Obama appeared at a forum at the University of Miami hosted by Univision. Corruptocrats at work—Cartoon of the Week.